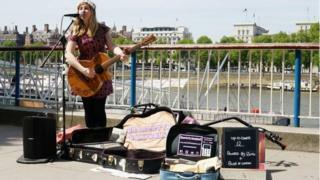 London has introduced a contactless payment scheme for buskers in what the organisers claim is a world first. In addition to tossing loose change into a box, passers-by can use card readers to make contactless payments. It has been launched in partnership with Swedish tech firm iZettle, bought this month by US payments giant PayPal. “Now, more Londoners will be able to show their support to the capital’s brilliant, talented street performers,” said London mayor Sadiq Khan. He announced on Sunday that the scheme will be be rolled out across the city after successful trials. Charlotte Campbell, a full-time busker, was part of the trial and says that after two weeks it “had a significant impact on contributions”. The card readers, which plug into smartphones and other devices, allow tap-to-donate fixed payments. “More people than ever tap-to-donate whilst I sing, and often, when one person does, another follows,” Ms Campbell said. The organisation Busk in London, which is working with iZettle on the scheme, said it would be made available to buskers in all the capital’s boroughs over the coming months. Using card readers for online payments is becoming increasingly popular among small traders and charities who cannot afford the infrastructure traditionally used for credit card payments. Earlier this month PayPay announced it was buying iZettle for $2.2bn (£1.6bn). Founded in Stockholm in 2010, iZettle started out selling credit and debit card readers, but has more recently expanded with an e-commerce platform which tracks items such as sales and inventory for its customers.